Last Friday, five local skaters met with a designer and staff from the county Department of Parks to discuss building a temporary skate spot at Woodside Park in Downtown Silver Spring. Everyone hopes it'll be open by this summer, but concerns remain about how other park users will interact with the facility. 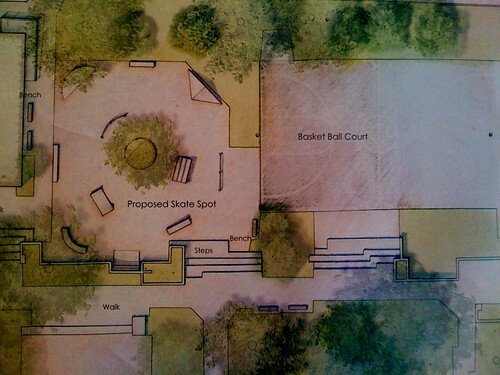 The proposed skate spot would be located on the north side of the park located at Georgia Avenue and Spring Street, in a clearing between the gym and the basketball courts. It's about 65 feet wide and 56 feet long, or about 4,000 square feet. It's next to an existing set of stairs that skaters already do tricks on, affectionately called Big Four. Plans for the skate spot, shown above, would contain several modular pieces like a pyramid, a "fun box" or low shelf, and a quarter-pipe that would be dropped into a concrete slab. The pieces would be arranged around a new, ornamental tree. 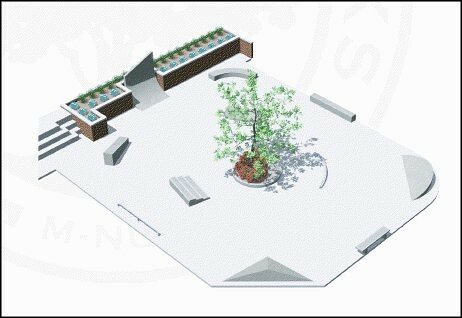 Planners envision ledges around the tree for sitting and a short ramp for doing tricks on. They say the tree's a way to make the skate spot look more attractive. "We want it to look inviting to a mother pushing a stroller," said staff member Ching-Fang Chen. "That way, the neighborhood will be more open to it." Early drawing of the Woodside Park skate spot with the tree in the middle. But skaters worried it could be disruptive or even dangerous for those using the space. Keir Johnson, a skater who grew up in Silver Spring, explained the "flow" of skate parks: users will start at one end and build up speed to do a trick on the other before turning around and doing it again. The tree would block flow or potentially be a hazard if kids can't slow down before running into it. "It feels cramped," said Johnson. "It looks like it was designed for prettiness," said Downtown resident Maryam Balbed, who began skating with her kids a year and a half ago and goes by the nickname Sk8ter Mom. "We have to design it for children's health and safety." Aaron Spohn of Industry, California-based Spohn Ranch, the company contracted to build the modular pieces, agreed to take out the tree from their final design. Spohn shared catalogs of Spohn Ranch skate parks across the United States, including one in Guantanamo Bay, Cuba for sailors stationed at the naval base there and their families. Closer to home, the firm is building a skate park at the North Laurel Community Park in Howard County. Skaters suggested other things that they'd like to see in the design. One was a combination ramp and stairs designed to look and feel like one you might see outside an office building, which could appeal to street skaters who now get chased off real-life versions of it across Downtown Silver Spring. 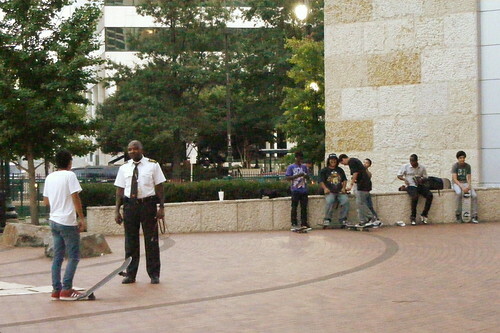 Skaters regularly get chased out of otherwise unused Downtown plazas. Johnson rattled off a list of things that local skaters like to use: ledges; a flat bar, a long, thin metal rod for grinding on; steps; a pyramid; a quarter-pipe, and a bank. "I think if we want to make the best use of the money and the space, we want things we're gonna use," he says. "If it has those five things in it, people will be psyched." As a high school student in the 1990's, he managed East of Maui, a skate park on Ellsworth Drive that closed to make way for the Downtown redevelopment, where he and his friends ran camps and arranged skate demos. "I loved that place," says Johnson, who currently works as a field producer for reality TV shows. "It was a huge thing. 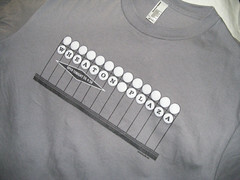 It made Silver Spring very prominent." Given the size and significance of East of Maui, it's unlikely that the Woodside skate spot could meet the need of Silver Spring skaters. Last fall, JUTP crunched a formula from Skaters for Public Skateparks that determines how large a skatepark needs to be based on an area's population. We estimated that approximiately 900 people in Silver Spring would use one on a regular basis, requiring a park nearly three acres in size. Citing those figures, Sk8ter Mom worried that the Woodside skate spot could be overwhelmed. "This is like throwing a sandwich into a hungry crowd," she says. "All the little kids who don't go downtown, their parents are gonna bring them here." 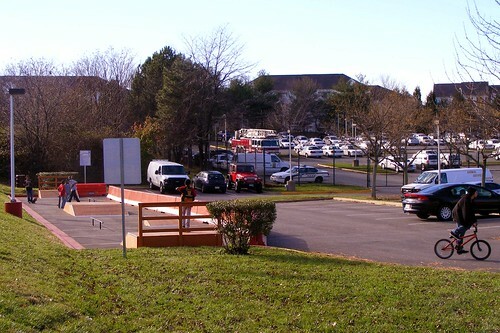 The skate spot will cost approximately $69,000 to fabricate and install the modular pieces, according to project manager Ellen Masciocchi, in addition to the cost of laying the concrete slab, which is currently unknown. By comparison, planned parks in College Park and Clinton could cost $250,000 and $300,000, respectively, while a temporary skate spot built by police officers in Germantown cost only $1,000. If all goes well, construction could start on the skate spot this spring and it could open in time for Go Skateboarding Day on June 21. One year after the skate spot opens, the Parks Department will conduct a review, seeing how well it's used, how expensive it is to maintain, and how many complaints it has generated. After that, they'll decide whether to keep the temporary park or start planning for a permanent one. Even then, a permanent skate spot won't be built until Woodside Park is scheduled for renovations, likely within the next seven to eight years. Sk8ter Mom questioned how much sway the park's neighbors will have. While most in the adjacent Woodside Civic Association support the project, a handful of neighbors managed to stall the project last fall, while plans several years ago to build a larger skatepark on Fenton Street were scuttled by neighbors there. "How much power do we give the residents?" she asked. "They own their homes, but they don't own the park. Do they get to dictate this project?" This is the second meeting that the Department of Parks has held with skaters about the project, and despite the lingering concerns, local skater and Blake High School student Christian was happy about getting results. "We got rid of the tree," he says. "We got a lot covered." Fellow skater and high school student Alex felt similarly. "At least we got to put a say into what we want in it," he says. Work was stopped recently on renovation of several playgrounds in county parks all around the county, including one in my neighborhood just north of the beltway. We've been told county that someone questioned construction related to the renovation at Woodside Park. They questioned whether the proper permits had been issued, and despite permits never having been needed before on playground renovations, the determination has been made that permits now are needed. This has caused huge delays. Could this have to do with neighborhood opposition to the skate park at Woodside? That's my conspiracy theory speculation. It would be most unfortunate if true, because playground renovation has halted throughout the county. Kids are waiting for their new playgrounds, and the contractors who install them are waiting for work. All because of opposition to a skate area in one park? I hope I'm just paranoid. Woodside Civic Association (which represents the neighborhood where the park is located) voted unanimously to support the skate facility project, subject only to a handful of conditions that we believe can be readily accommodated. Those conditions have nothing to do with whether the facility is pretty or includes a tree -- we asked only that the Parks Department address security issues (through a commitment by the Park Police to patrol the park more regularly and the incorporation of better lighting and sight lines). Our civic association wants to see the skate park get built and wants to see it succeed for both skaters and the surrounding property owners. By the way, I have no idea who complained about permit issues related to the playground equipment, but it is a safe bet that the skate park is not connected to this complaint. The neighborhood has been clamoring for improved playground equipment for years. Yeah. I seriously doubt that the skatepark is in any way connected to halting park renovations countywide. As Casey said, most of the neighbors are supportive of the Woodside skate spot - much more so than around the proposed one at Fenton Gateway Park that was largely killed due to neighborhood opposition. Okay conspiracy theory disproved. As I said, it was pure speculation on my part. I'm glad to hear there is neighborhood support for the skate park at Woodside. Someone did call the county about all the construction activity at Woodside sans permits, though, which appears to have thrown a huge wrench in playground renovations county-wide. are there any insurance issues involved with a skate park. If someone gets hurt can they sue someone? I would hate to see someone sue the County if theyare injured at a skate park. Anyone else but me feel for that lone tree? Dang, what type of life and root system development will it have being banged into, hung off, and surrounded by concrete. A row of shade trees pff to one side would make much more sense. PS I'd like to see those figures on 900 people using it. 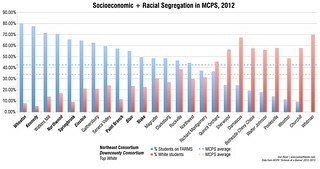 When the vast majority of households in this part of MoCo are singles with no depedendents that just does not add up. Not saying the skate park won't see good usage and draw those even outside SS, but 900?! this is the math I did to decide how many people potentially skate in Silver Spring. It's based on the number of youth, so it doesn't include people over 16. But I wouldn't automatically assume that older individuals wouldn't skate. After all, two of them were at the meeting. I am 39 years old, am married have two sons and skateboard a few times a week. I own a home in South Four Corners, have a halfpipe in my backyard. There are plenty of older skaters in the area, hundreds over the age of 16. I see many of them regularly at parks in PG county(Greenbelt, Bowie, soon College Park) VA, and Washington, DC. There really needs to be a free quality skatepark in Silver Spring.